3. Michael Matthews (aus) s.t. 4. Davide Cimolai (ita) s.t. 5. Sep Vanmarcke (bel) s.t. 6. Pieter Serry (bel) s.t. 7. Vicente Reynes (spa) s.t. 8. Leonardo Duque (col) s.t. 9. Oliver Naesen (bel) s.t. 10. Arnold Jeanneson (fra) s.t. 5. Ion Izagirre (spa) s.t. 6. Geraint Thomas (gbr) z.t. 10. Richie Porte (aus) s.t. 17. Alberto Contador (spa) z.t. With 4 kms done Wouter Wippert, Lars Boom, Edward Theuns, Stijn Vandenbergh, Arnaud Courteille, Arnold Jeannesson, Matthias Brändle and Jesus Herrada are off. 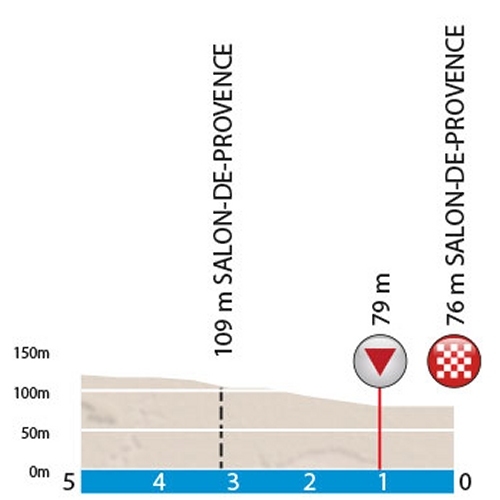 The eight riders race to a maximum lead at over 11 minutes, but on the flanks of Mont Ventoux the gain is down to under 8 minutes. Courteille and Herrada are the first to arrive in Chalet Reynard, while Vandenbergh, Boom and Duchesne re-join them in de descent. With 40 kms left Duchesne goes solo. Just before the last climb, Col de Seze, his former companions are reeled in by the pack. After the drop Duchesne enjoys a 0’37” gain. In the flat closing section Luzenko bridges the gap and leaves the Canadian behind, who is reeled in a little later. Lutsenko soloes to victory, while the sprint of the bunch is won by Kristoff with Michael Matthews third, thus taking a time bonus of 4 seconds. Winner Lutsenko takes a time bonus of 10 seconds and he is now second, 6 seconds down on the leader.